At the beginning of the year, teachers work actively with students to create a responsible and caring community so that all students will be able to achieve their goals and aspirations. As students and teachers discussed the key components of a healthy community, students shared stories about family experiences in their local communities. Many students spoke about volunteering for local agencies with their families-cleaning up a local stream or collecting clothes for a homeless shelter. Students also spoke of service learning experiences in other grades such as working with Backpack Buddies to provide healthy weekend meals for low income children and visiting a local nursing home. Students brainstormed local, national and international service organizations and then students and teachers narrowed the list to possible organizations in the community that students might investigate. Teachers sent an e-mail to parents asking them to share any connections they had with local volunteer organizations. Teachers kicked off the project by telling students that they decided to do a project based on the wonderful volunteer experiences that they’d shared. Tamara, our language arts teacher, told how she volunteered for "Team in Training," the Leukemia and Lymphoma Society's endurance sports training program. She described how team members raised funds to help support the LLS. Marilyn, a former kindergarten teacher, told students of her weekly volunteer experiences with the Durham Literacy Council. Students added their own stories. Next, students worked in small groups and brainstormed everything they might want to learn about local service organizations. They wrote each idea on a post-it and then organized the post-it's into categories. Then, the class made a giant topic web of all the ideas they wanted to investigate during their project. How did the organization get started? What is the organization trying to accomplish? How does the organization get the word out? How much money does the organization raise a year? What is the money used for? What inspires volunteers to invest their time and energy in this organization? With these questions and topics in mind, teachers and students selected seven local service organizations to investigate in depth so that we could learn what they provide to our community and how we could give back through working with them. We selected: Animal Protection Society, Habitat for Humanity, Meals on Wheels, The Piedmont Wildlife Center, Pretty in Pink, and The Ronald McDonald House of Durham. Teachers used a volunteer application process to divide students into groups. Just as our local service organizations do with their potential volunteers, teachers had students fill out a volunteer application and participate in a mock interview. Teachers used this information to divide students into small groups, each group focused on learning about one service organization. Once the groups were formed, students drafted interview questions and teachers reviewed how to take notes and compose photographs that would tell the story of each service organization. Students conducted some preliminary interviews on the phone and then visited the service organization to learn more about their mission and operations. At some organizations, like Meals on Wheels, students actually got to work alongside volunteers. Back at school, the media specialist used this opportunity to teach students how to gather information from Web sites. The last step in the research phase of the project was analyzing and synthesizing all the information the students had gathered about their service organization. Working in small groups, students reviewed their notes and photos. Their goal was to educate others about their organization with the hope of increasing activism and volunteerism. The class decided to host a Volunteer Fair to raise awareness of the many needs in our community and to motivate others to volunteer. They invited parents, faculty members, and other middle school classes. What would their fair look like? What would guests need to know? What kind of information would they display to educate guests AND motivate them to volunteer? Students spoke to several adults who had attended such fairs and learned that they frequently had booths with attractive displays, flyers for people to take home, and often opportunities to sign up to volunteer right there. Drawing on their project work from the lower grades, students knew how to create display boards with neatly mounted pictures, eye-catching headings, and text summarizing key concepts they wanted others to learn. Students also knew the importance of communicating through new technologies. For the past two years, our technology specialist has worked hand in hand with our writer's workshop teachers to teach multimedia the same way we teach units of study in writing. When beginning a unit of study in writing, students study mentor texts and record what they notice so they can then apply those techniques to their own work. Teachers keep copies of touchstone texts in the classroom so that students can refer back to them as students draft and revise their own texts. Building on this method, our technology teacher taught students some new ways to use multimedia in their Volunteer Fair. Students studied touchstone Prezi, Windows Movie Maker and Tagxedo presentations and these presentations, were added to our “Multimedia Touchstones” folder on our school website. The site has both touchstones and simple “how to” steps and students in all grades can refer back to them for presentation ideas. As the fifth graders discussed their booths for their Volunteer Booth, they decided what method of multimedia would be most effective in communicating to visitors. On the morning of the culmination, each student group had a booth with traditional and new media to teach parents and other classes about their organization. The directors from the Piedmont Wildlife Center, Pretty in Pink and Meals on Wheels attended the Volunteer Fair because they were so impressed with the work the students did when interviewing them. From a curricular perspective, the students learned a lot. They deepened their interviewing skills, their abilities to communicate effectively with adult experts beyond the school setting. They became more skillful at navigating Web sites for the information they needed.They learned to analyze, synthesize, and organize a great deal of information from a variety of sources. They learned to present information to others using traditional and new forms of media. 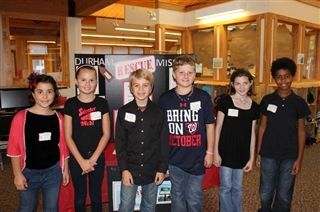 But, even more importantly, students learned that they could make a difference. As a result of their project, the students developed a list of potential parent and faculty volunteers that they passed to their community organizations. Just three weeks after the culmination, two families had already volunteered and the group of students who investigated Pretty in Pink, a breast cancer awareness group, was asked to set up their display at a car dealership in Raleigh, to raise community awareness for the volunteer organization. This was clearly a successful project!